If you get the chance to spend a Summer in a Spanish program in Madrid, you will never come across a day without plans. This portico lined square is situated at the heart ofHapsburg Madrid, the old part of the city and one of the capital’s mostcharming districts. Here you can find the Casa de la Panadería, Arco de Cuchilleros, and a statue of Philip III. The foundations of Plaza Mayor were laid when Philip II’s court moved to Madrid from the former Plaza del Arrabal. Plaza del Arrabal is where the town’s most popular market was located towards the end of the 15th century. In 1617, architect Juan Gómez de Mora was commissioned to create a greater uniformity amongst the buildings in this location, which for centuries had hosted popular entertainments, bullfights, beatifications, coronations and the occasional auto de fe. If you want to place yourself in a historical context during your Spanish program in Madrid, Plaza Mayor is the place to be! 2. Museo Nacional del Prado. This museum is the main Spanish national art museum, located in central Madrid. It features one of the world’s finest collections of European art, dating from the 12th century to the early 20th century, based on the former Spanish Royal Collection, and unquestionably the best single collection of Spanish art. Founded as a museum of paintings and sculpture in 1819, it also contains important collections of other types of works. 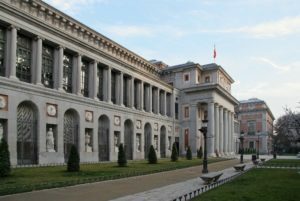 El Prado is one of the most visited sites in the world, and it is considered one of the greatest art museums in the world. The numerous works by Francisco de Goya, the single most extensively represented artist, as well as by Hieronymus Bosch, El Greco, Peter Paul Rubens, Titian, and Diego Velázquez, are some of the highlights of the collection. If you are an art lover, be sure to visit El Prado during your Spanish program in Madrid. Students get in for free with ID! Also referred to as El Retiro, this park is one of the largest parks of the city of Madrid, Spain. The park belonged to the Spanish Monarchy until the late 19th century, when it became a public park. Many activities take place in the park. From late May through early October, every Sunday at midday, the Banda Sinfónica de Madrid gives free concerts from the bandstandin the park near Calle de Alcalá. The Park also features an annual Book Fair and has shelves where people will drop off their used books, magazines, or newspapers. There are events throughout the year such as concerts, firework shows, and holiday/cultural events. Around the lake, Retiro Pond, many puppet shows take place along with all kinds of street performers and fortune tellers. Rowboats can also be rented to paddle about the Estanque, and horse-drawn carriages are available. If rowing is not y our forte there is a solar powered boat you can book passage on as well. 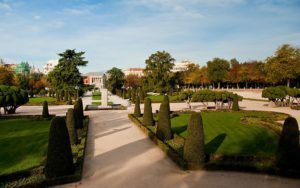 If outdoor activities are your specialty, feel free to grab a blanket and go for a picnic at El Retiro or participate in one of their many activities during your Spanish program in Madrid. This is one of the world’s most famous and prestigious football venues. It is the current home stadium of Real Madrid and has a current capacity of 81,044. The stadium has hosted the European Cup final on four occasions: 1957, 1969 , 1980, and the UEFA Champions League Final in 2010. The final matches for the 1964 European Nations’ Cup and the 1982 FIFA World Cup were also held at the Bernabéu. Soccer is Spain’s national sport and easily the country’s most important participant and spectator sport. Spanish soccer fans are among the most dedicated and fervent in Europe. 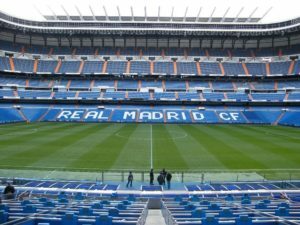 If you want to truly immerse yourself in Spanish culture during your Spanish program in Madrid or are a soccer fanatic tickets to a soccer game at Santiago Bernabéu are a must! This is an upscale shopping street located in central Madrid. Today the street is known as the Spanish Broadway has one of the most active nightlife in Europe. Like New York, it is known as the street that never sleeps. It reaches from Calle de Alcalá, close to Plaza de Cibeles, to Plaza de España. The lively street is one of the city’s most important shopping areas, with numerous hotels and large movie theatres; however, in recent times many of these theatres are being replaced by shopping centers. The street is also noted for the grand architecture of many of its buildings and is considered a showcase of early 20th-century architecture. 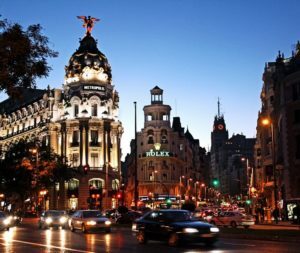 With patterns ranging from Vienna Secession style to Plateresque to Neo-Mudéjar to Art Deco, along with others, Gran Via is a great site to visit during your Spanish program in Madrid if you enjoy shopping and/or great architecture. Now that you know just the places to visit while you are visiting Madrid, be sure to plan your time accordingly so you can study Spanish and then put it into practice with Spanish locals at all of these locations! There is no better way to learn a language than by immersing yourself in the culture and putting your knowledge to the test. 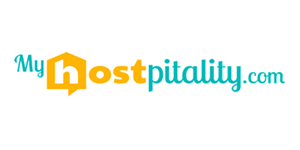 If you would like to further your Spanish learning even further, MyHOSTpitality can help you find a host family in Madrid with whom you’d live for free and only for exchange of teaching them your native language for an agreed number of hours! For more information on how you can give yourself total cultural and linguistic immersion during your stay in Madrid you can out this post: How to learn Spanish by becoming a guest with MyHOSTpitality. Also, if you plan to do some traveling around Spain during your Spanish program in Madrid be sure to read this post as well: What to visit in Barcelona to learn Spanish.